Since I'm still shell shocked that the New DC 52 is blowing Marvel Comics out the box, from time to time I dig back in the Marvel crates hoping that at least one title will spark my interest. And being the crate digger I am I know that if you keep diggin' long enough...you'll eventually find something. And I'm glad I kept diggin' cause I came across a nice 'lil gem in the Marvel Universe called The Ultimate Spiderman. In a nutshell, Peter Parker is dead. Yup...you heard me right, Spiderman got murked out. 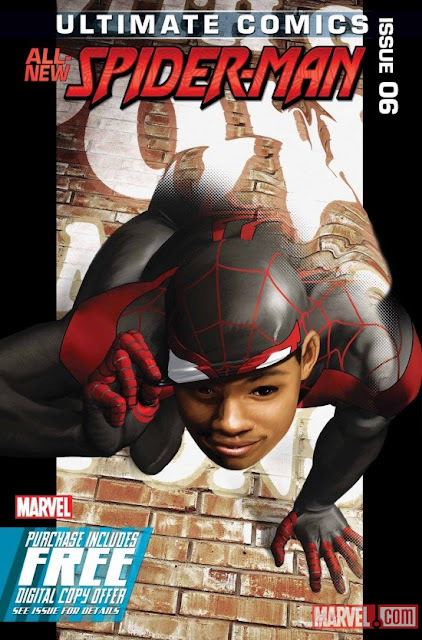 So now you've got Miles Morales (a black kid from the Planet of Brooklyn) who's uncle Aaron is just like one of the uncles in YOUR family who's ALWAYS in and outta jail and also happens to be the villan The Prowler. So, The Prowler steals Norman Osbourne's formula (he extracted some of Peter Parker's blood to recreate the spider that bit Parker) but doesn't peep that one of the testing spiders got in his bag. After winning a charter's school lottery to get accepted to the better school so he wouldn't have to go to the neighborhood hood school, Mile goes over his uncle house to check him out. But while he's there, he's bitten by the spider that escaped from Osbourne Labs. Eventually he finds out he has super powers (two that Parker didn't have - the ability to turn himself invisible and a "venom strike" that can paralyze people) and he only shares this with best friend Ganke who in turns gives him an old Spiderman costume he had from Halloween to rock. So while Miles is out and about trying out his new powers, Spider Woman runs up on him feeling some kinda way that there's someone out here acting like Spiderman. After a quick beef between the two, she unmasks Miles and takes him to S.H.I.E.L.D. Headquarters where Nick Fury lets Miles know that he already knows about him and his powers as well as his uncle being The Prowler. During their convo Electro pops on the scene and while none of the Avengers seem to be able to stop him, Miles steps up to the plate and takes him down with his "venom strike." After seeing that Miles can hold his own, Fury gives him a new black & red costume to hold him down. 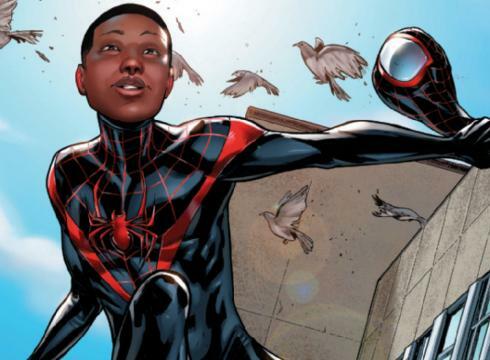 But eventually news of the new Spiderman gets to the ears of Miles' uncle who puts two and two together and realizes that Miles must be the new Spiderman. So why do I think this comic is so good? Well, how about it's a predominately black comic book by a major comic book publisher? How about Mile's uncle (who remember just happens to be a bad guy) knows his secret identity? Is his uncle gonna drop dime on him? Is he gonna blackmail Miles into helping him commit crimes to keep his identity from Mile's father? (who just happens to HATE superheroes, mutants, etc.) Who knows what's gonna happen...which is why this comic is SO good! I'm just relieved that Marvel has something left in the tank...I was getting worried about them for a minute.